Hope you like my new blog look ....had a job with putting it on ..but Finally did it !!!! Picture not to good ...sorry!! Gosh you have been busy...these are great and a lovely idea for gifts. Hi Sylvie, sounds like you had a good night in the Square, sounds like a wonderful place to have a new years party. your desktop calenders look great. very special. These are so gorgeous!!! I am not surprised you had a queue of customers. Love your new look blog too!! Love the new look to your blog v.nice! 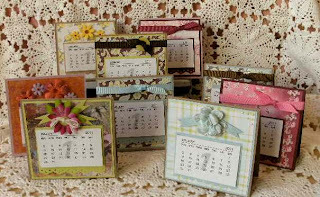 the calendars are lovely Sylvie and the new blog looks really pretty and welcoming. These are fabulous gifts for friends. Brilliant crafting. oooh love these Sylvie. Happy New Year to you. When you coming to Coventry?